Time flies. I have already passed the 4 month mark. One-third of my time in Houston. I already know what I will remember the most. Mosquitoes and potlucks. The mosquitos are relentless and well, I am discovering the joys of vegan potlucks. I have been to many a potluck, but usually that means I bring a dish I will be eating. It is usually the only vegan component and I try to make it a complete meal, like a hearty bean or whole grain salad. Even though that is my specialty, it kind of limits my repertoire. All vegan potlucks are a whole other ballpark. I know I will find plenty of food (and they have been really tasty!) and therefore, I can branch out to try something new. Furthermore, some foods lend better to a buffet set-up than others, so I have been testing out new ideas. Enter the cucumber sandwich. Not a tea sandwich, this one replaces the bread for cucumber, creating a crunchy bite-sized nimbler. Easy to add to your plate and no fussy sauce that can leach and contaminate the next dish over. (I have adopted the 2 plate strategy for potlucks- 1 plate for savoury and 1 plate for desserts!) Perfect for those who want a gluten-free and nut-free snack… and raw, to boot. For me right now, raw has become more synonymous with easy food prep. This dish, while easy to prep, is a bit more fussy than my typical one-pot meals. Puree your cucumber and lemon juice into a mayonnaise-like consistency and pulse in the cool and crisp cucumbers and herbs. The lemon juice should prevent the avocado from oxidizing but try not to make them too far in advance. Hopefully they will be devoured and none will remain after they have been served. What are your go-to potluck dishes? This is my submission to Deb for this week’s Souper Sundays, to this week’s Raw Food Thursdays, this month’s Cooking with Herbs, to this month’s Random Recipes, and to this month’s Veg Cookbook Club for Isa Does It. 1. In a food processor, combine the flesh of the avocados with the lemon juice and salt. Puree until completely smooth, scraping the sides as necessary. Add the cucumber and pulse until finely chopped. Add the herbs and pulse until just combined. Allow to sit for 10 minutes as the flavours meld. Season to taste. 2. 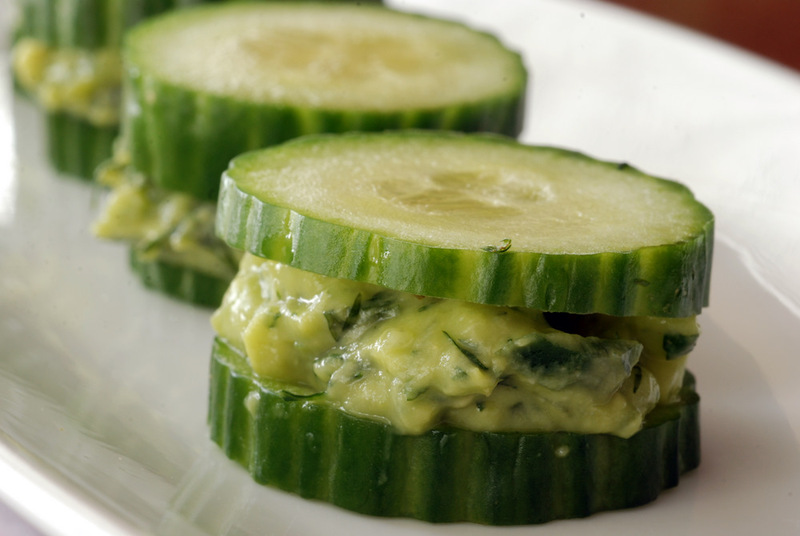 Spread mixture overtop cucumbers slices and if desired, top with a second slice, to make a bona fide cucumber sandwich. You could also keep it open faced, as the filling oozed out if you ate this in two-bites. Makes 12 cucumber pieces (or more). I love these sandwiches – perfect for summer here – such lovely light finger food would suit any gathering. I can already think of a few events I would love to take these to. Wow 1/3 of your time there gone! Time is ridiculous sometimes isn’t it? I can hardly get over the fact that Christmas displays have popped up. Wasn’t it just summer like a week ago?? I can’t say that I go to many commercial establishments but I think Americans will be distracted by Thanksgiving for a few more weeks… but then Christmas explosion, for sure! I love the idea of this gluten-free tea-like sandwich. So cute! 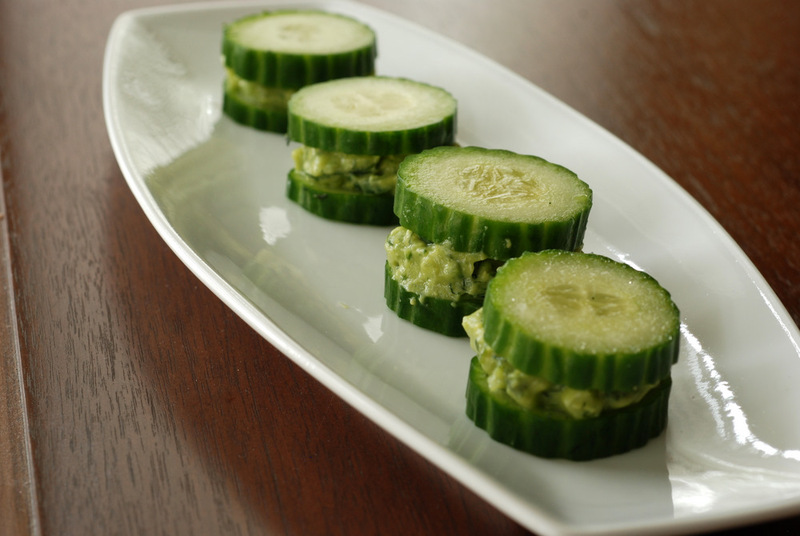 Avocado, cucumber and herbs sound like a perfect appetizer, especially since it must still be pretty warm in Houston. NOM. Hey Eileen, Thanks! We had a cold spell for 2 weeks or so, but now it is back to summer weather with lows of 25C! Not cold at all! These make a lovely canapé! Great idea. Have you seen my courgette rolls? Thanks, Deena. They sound like a great idea, too. I was looking forward to you posting this! Dil, mint, cucumber, and avocado is the best combo. Now I’m hungry. Again. I need to scout out some all-veg potlucks in NYC! They sound amazing. I would love these refreshing bites! I’ve done this too with feta cheese in between lol! Mint sounds amazing though! Divine…and adorable sandwiches with refreshing mint! Bloody brilliant. I love all of the ingredients in these little sandwiches. I’m pinning these for my next party..
What a FABULOUS idea Janet, I LOVE these! Mmmmm, I’m including this recipe in my Raw Foods Thursdays “perfect raw day” post tomorrow. Thanks for sharing such a creative sandwich!